Motorcycle thefts rose slightly in 2016 compared to 2015, but the crime rate is still way down from where it was 10 years ago. So says the National Insurance Crime Bureau (NICB), which just released its annual report on motorcycle thefts in the United States. In 2016, 46,467 motorcycles were reported stolen, compared to 45,555 in 2015 – an increase of 2 percent. “Although 2016 delivered another slight increase in motorcycle thefts, national motorcycle thefts are down considerably since 2006,” said NICB strategic analyst P.J. Jalowiecki. Thirty percent down, in fact: in 2006, NICB reported 66,774 motorcycles stolen. The top 10 states with the most reported motorcycle thefts in 2016 were, in descending order: California (7,506), Florida (4,482), Texas (3,692), South Carolina (2,057), North Carolina (1,847), New York (1,731), Indiana (1,397), Georgia (1,296), Missouri (1,195) and Nevada (1,177). The top 10 cities reporting the most motorcycle thefts were, in descending order: New York, NY (1,209); San Diego, CA (849); Las Vegas, NV (818); Los Angeles, CA (760); San Francisco, CA (616), Miami, FL (610); Houston, TX (607), San Antonio, TX (411); Phoenix, AZ (347); and Austin, TX (343). The top 10 most stolen brands last year? Highest to lowest, they were Honda (9,052 reported thefts), Yamaha (7,723), Suzuki (6,229), Kawasaki (5,221), Harley-Davidson (4,953), Taotao brands (2,673), KTM (762), Ducati (521), Genuine Cycle (463) and Kymco (453). While BMW was not in the “top 10 stolen brands” ranking, it is getting more popular with thieves: 415 BMWs were reported stolen in 2016 vs. 312 in 2015 – a 33 percent increase. KTM also experienced a higher incidence of thefts, 762 in 2016 vs. 630 in 2015 – a 21 percent increase, according to NICB. The lowest national stolen bike rates were in Vermont, Maine, South Dakota, New Hampshire and Wyoming, although Wyoming reported 51 motorcycles stolen in 2016 – a 143 percent jump from the previous year. Honolulu County in Hawaii: 199 reported thefts in 2015 rising to 284 in 2016 – a 43 percent increase. Not surprisingly, theft rates increase when the most number of bikes are outside. 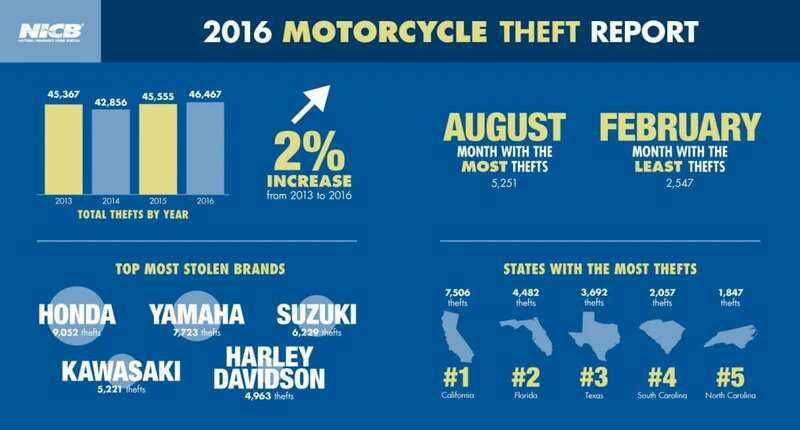 “The most motorcycle thefts occurred in August (5,251) and the fewest in February (2,547) which continues to reflect a weather-influenced pattern that is consistent with previous years,” NICB stated. July and September were the second- and third-highest months last year for reported thefts. The NICB analyzes thefts as well as recovery rates for the 50 states and District of Columbia. Of the 46,467 motorcycles stolen in 2016, about 40.4 percent had been recovered by the end of February 2017, the organization stated.